SpyFighter cleans browser’s history, temporary files, cookies, auto complete form’s data, and manually entered addresses. 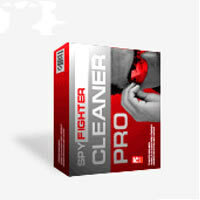 SpyFighter Cleaner Pro consists of two very powerful software modules that will take care of the security of your computer and safety of your private information. One is a powerful tool for a removal of spyware, adware, toolbars, internal popup programs, dialers and other sorts of “malware”, another is an advanced Internet Washer with a PC Cleaner that will take care of fast and reliable cleaning of the information left behind by Windows. Free lifetime updates of software itself !